Portugal’s Cristiano Ronaldo is the most marketable footballer in the world, according to rankings released today by global sports marketing research firm Repucom. Argentina’s Lionel Messicomes in second with a surprise entry from Spain’s Gerard Piqué completing the top three. The ranking was created using Repucom’s Celebrity DBI tool which measures the perceptions of 6500 people in 13 international markets, representing the views of more than 1.5 billion people. 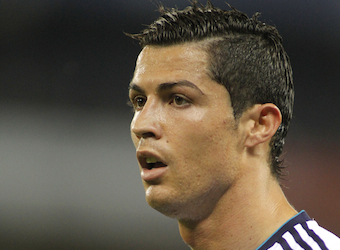 Paul Smith, Australian founder and CEO of Repucom says Ronaldo is a dream endorser. “With just over two weeks to go before the 2014 FIFA World Cup kicks off, the world’s gaze is firmly on the competing teams and players. The World Cup is the most watched sporting event in the world and as such, big brands, official partners or otherwise, will and are using its global appeal to drive sales. Fernando Torres is a surprise inclusion. The Spaniard’s global notoriety especially in markets like China have contributed to making him the third most recognized player globally. 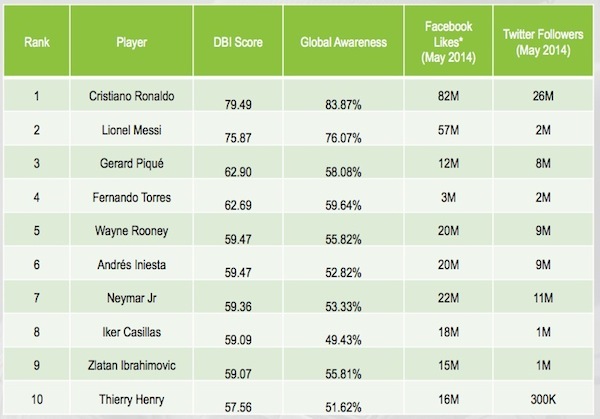 Other entries in the top 10 include Brazil’s Neymar JR, England’s Wayne Rooney and Sweden’s Zlatan Ibrahimovic.